In my previous posts about how scholarly communications must transform, I've focused on ideas such as openness and standards compliance. This post focuses how and why scholarship of the digital age must be syndicated to be significant. 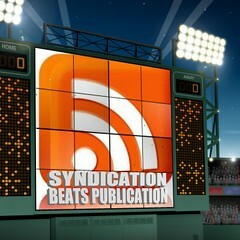 Syndication is associated with mass media like television or print journalism. But a revolutionary web standard has made it possible for almost any kind of content to be broadly distributed across diverse outlets. That standard is RSS (Really Simple Syndication), and it offers a superior method for disseminating scholarship than traditional publication. Academic publishing is about more than dissemination, to be sure, but scholars would do well to understand this more flexible communications medium whose reach goes further than any top-tier academic or scientific journal. You have probably seen that little orange box with the embedded broadcast icon in various places across the web. That's the RSS feed symbol. Such feeds are basic to Web 2.0 communication -- blog posts are syndicated through RSS feeds, photo sets like those posted to Flickr are syndicated, etc. The syndication of scholarly and scientific communication will not simply be an optional feature; it will be essential to serious learned communication in the digital age. To understand the value of RSS feeds and syndication to academic publishing, let me start with a comparison to something that traditional scholars already appreciate from the book world: the title page. Books didn't always have title pages, as hard as that is to believe. This was a convention developed in the early days of print that made it easier to get basic information such as the title, author, publisher, and date of publication. This "metadata" (as we'd call it today) became not just a convenience but an essential component of scholarly communication, which has for centuries depended on this information in order to find, use, document, and share book knowledge. The RSS protocol is much like a title page for a book, since it also carries standard descriptive metadata making it easier to find or reference content. However, it turbo-boosts knowledge beyond print possibilities because the RSS wrapper describes not an object of knowledge but a source of it. RSS turns web content into a "feed" or stream that is periodically updated and that can be readily ported for consumption across multiple platforms. As its name suggests, Really Simple Syndication turns knowledge into a broadcast medium. This makes knowledge more powerful: more timely, more flexible. Content can be "live" by being regularly updated through a feed; and through its open format it can be repurposed, aggregated, and customized for consumption, too. Print scholarship has always been updatable, of course. A new edition of a book replaces an outdated one, and the whole concept of the scholarly journal is that it is supposed to keep people in a given field up to date with "periodical" updates. But the RSS feed supplants traditional print updating in a number of ways. First of all, it is faster. The content streams of the web cycle much more frequently than the monthly or quarterly periods between issues of scholarly periodicals (or the years-long intervals between editions of books). As I said in my post about openness, this speed factor makes the difference between knowledge sources being perceived as open or closed. Today, something that takes months or years to update is not a "live" source of knowledge. It may have its uses, but it will always be secondary to the more timely content being pumped out to the web. RSS is the pump. In the old days, one wrote out a check and sent it by mail to a periodical which would spend weeks or months processing this, then you would start to receive your journals in the mail. Those journals would take months to create, and so the time difference between the printing of the journal and when you read it could be several months. Today, subscribing to periodical information that comes via an RSS feed is about a two-click process, is free, and instantly provides you information that is much more timely. The print paradigm cannot win against the ease of use and the timeliness of RSS-supplied content. It also cannot win against the customizable nature of RSS feeds. One can select an assortment of feeds to follow based both upon personal interest and upon personal consumption preferences. In other words, to get the set of incoming information most valuable to you, you can be much more specific than subscription to a journal. One can subscribe to a variety of feeds highly specific in their nature or in their appeal, aggregating all of these into a feed reader that is also customized to how and where one prefers to receive and use that content. One can even subscribe to customized searches by way of RSS feeds. All sorts of feeds now exist for distributing all sorts of content. These feeds are gathered, organized, and displayed for consumption in a host of different ways through software programs known as "readers" or "aggregators." These can be home-page type news readers such as iGoogle or MyYahoo, or delivered as "live bookmarks" through one's web browser, or brought in through an aggregator like Bloglines or Newsgator. Smart phones can receive RSS feeds through dedicated clients. Sophisticated readers like Google Reader integrate social tools with RSS feeds, so that it is possible to get a customized group of information channels piped to wherever you consume them (on a desktop, laptop, or mobile phone) and where you can then annotate and share these links with others. The social dimensions are critical and the subject of later posts. Suffice it to say that RSS complements the social web. We will see that just as people assemble and publish playlists for others to enjoy, scholars will do the same with feed bundles that they assemble. Wouldn't it be cool if you could tap into that interesting set of content streams that a given person is paying attention to? Well, that is possible right now because of RSS and software taking advantage of ways to bundle and share those feeds. Scholarly journals that go online but which keep their content from being syndicated through RSS feeds, just like those that let knowledge remain hidden behind toll-access barriers, are information silos. Scholars who send their hard-won knowledge to information silos do not really care about the impact of their work, even if they claim that work is published in a "high-impact journal." Impact is not going to be grandfathered into the digital age if those redoubtable outlets still carrying that clout from the print days do not retool the information they publish so that it can circulate in the maximized way that RSS feeds enable. How do you see RSS feeds being used to advance scholarship or scientific research? I think that as scholars begin to recognize the enriched knowledge streams these feeds make possible (particularly when combined with the social features of many aggregators), they will want to be sure that the knowledge they produce can flourish through syndication, not wither through mere publication. If everyone did this, then I could follow my favorite researchers without effort.